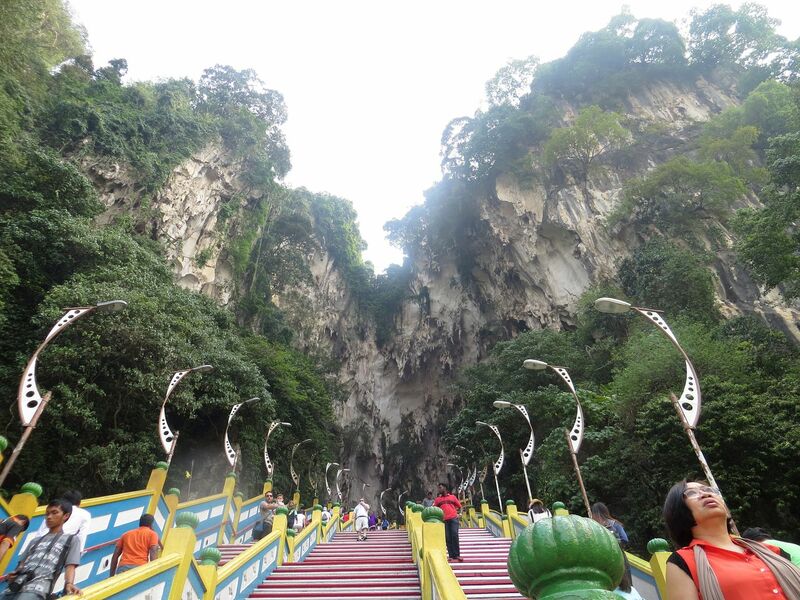 After more than 2 weeks, I am finally blogging my recent trip to Singapore and Malaysia. I'm sorry to those who waited for this. It's just that a lot of things came up so I didn't have the time to sit down and edit the videos and post the photos. Anyway, here are days 1 and days 2! We went to Singapore on March 20. Our flight was at 2 in the afternoon. In as much as I didn't want to travel with Cebu Pacific ever again, I just couldn't resist because they offer their seats so cheaply that I just had to pray they don't lose my luggage again. I got my round-trip tickets from Manila to Singapore last December 2014. I forgot what promo they had at that time but I was able to buy them for only Php 7,500. We arrived Singapore Changyi Airport at around 6 in the afternoon. Guess what! They didn't lose my luggage this time!! OMG, I had to suffer first because I stuffed all the important things in my carry-on bag. I also had to make sure my toiletries, undies and some extra clothes and favorite shoes were in it. So the bag was soo heavy! My friends that work in Singapore were so nice! High-school friend, Marinel, picked me up at the airport and helped me carry my luggage and she also helped me book our bus tickets going to Kuala Lumpur. 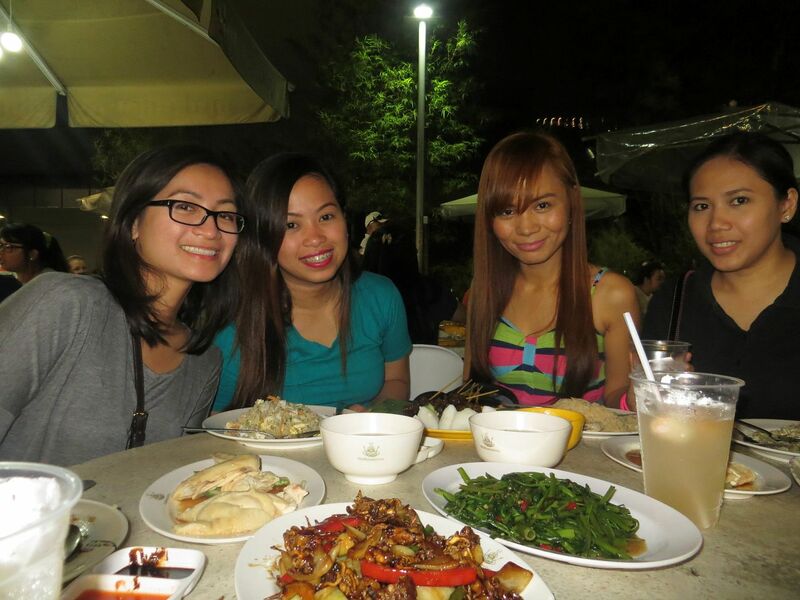 At around 7 PM, we met my college friend, Maricel. We wanted to save hotel money so we didn't book our hotel for that night since we were also leaving for KL. So, I asked her if she could keep our bags for us. We went to Makansutra to have dinner. They both were so nice as they really helped us and also treated us to dinner! Here is the vlog for Days 1 and 2! Enjoy! 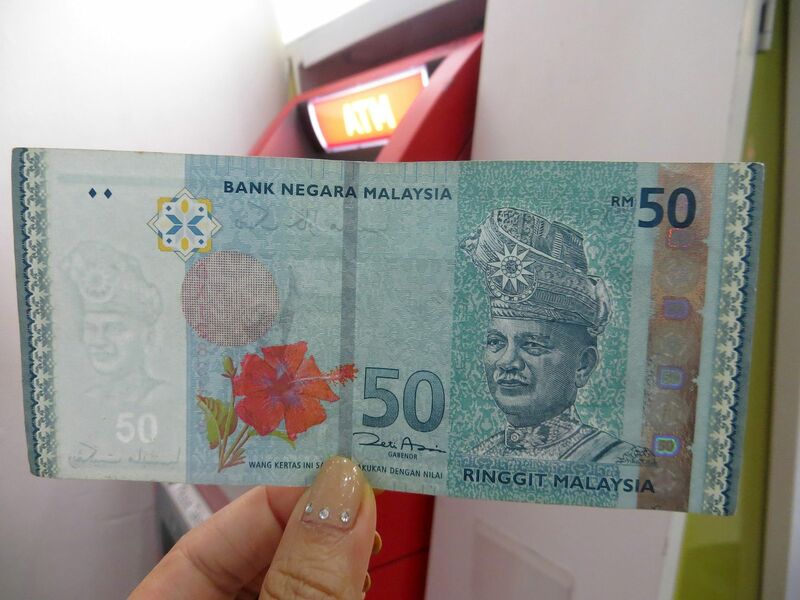 The crazy thing that we did was that we didn't have Malaysian money, not even Singapore money, when we went to Kuala Lumpur. We arrived Singapore so late at night that we weren't able to exchange money. We left Singapore at 12 midnight and arrived Kuala Lumpur at past 5 in the morning. We were kind of starving, tired and sleepy of course, but we didn't have money to buy food or train tickets. My cousin used her ATM and withdrew 50RM for us. That's about $14. 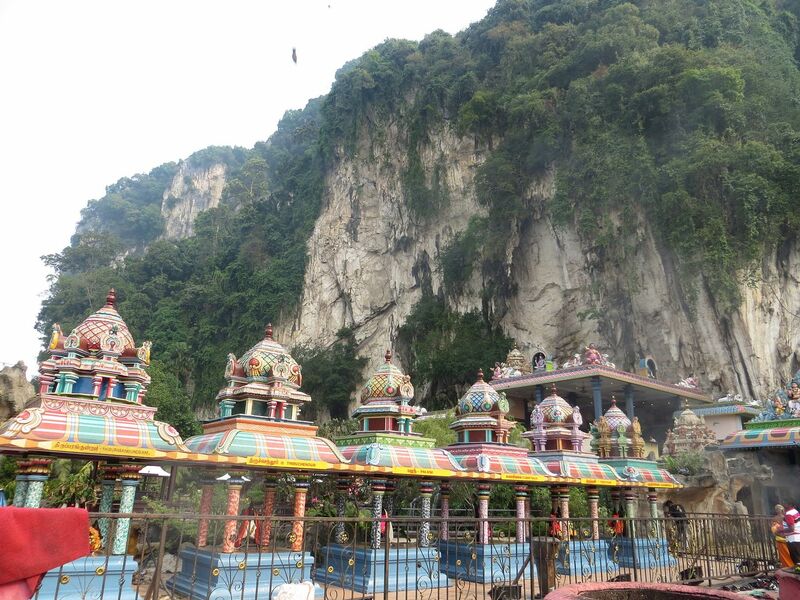 We then took the Monorail going to Batu Caves. 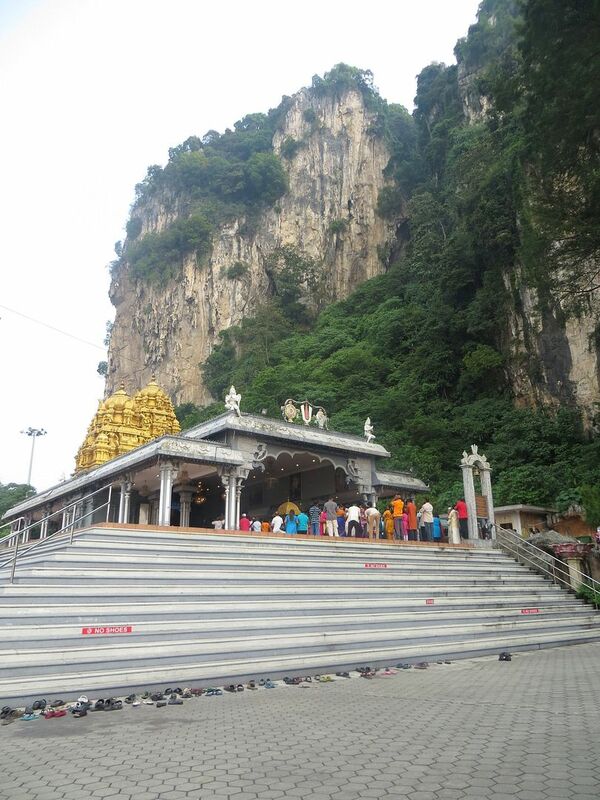 Going to Batu Caves from our bus stop was so easy since there's a train that stops right in front of it. We got there at around 8:30 in the morning. There weren't too may people yet and the weather was cloudy so we didn't have hard time exploring the place. Don't you think it's nice when you finally see in person places that you only see in pictures? Like this one! 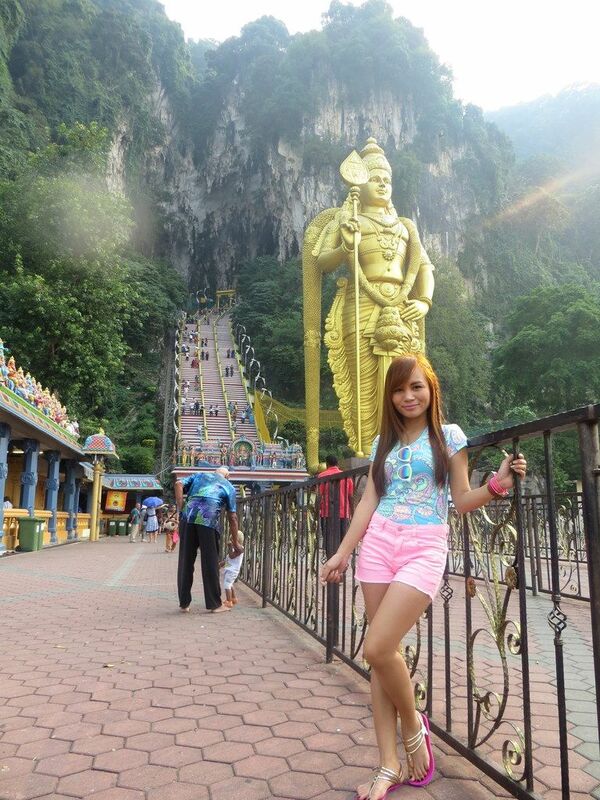 What's also nice about the places in Kulala Lumpur is that they are free for anyone to see! 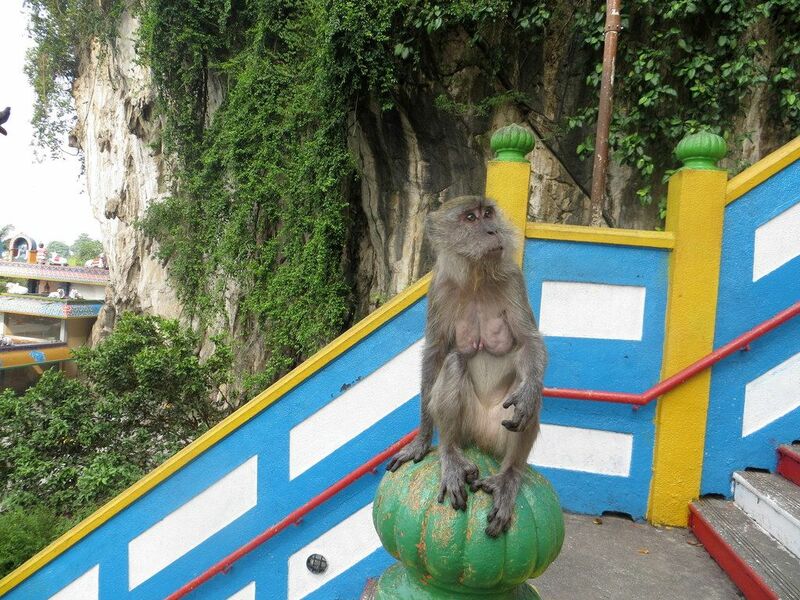 Oh, when you decide to climb the stairs going up the cave, be mindful of the monkeys! They are lots of monkeys that roam in the area. 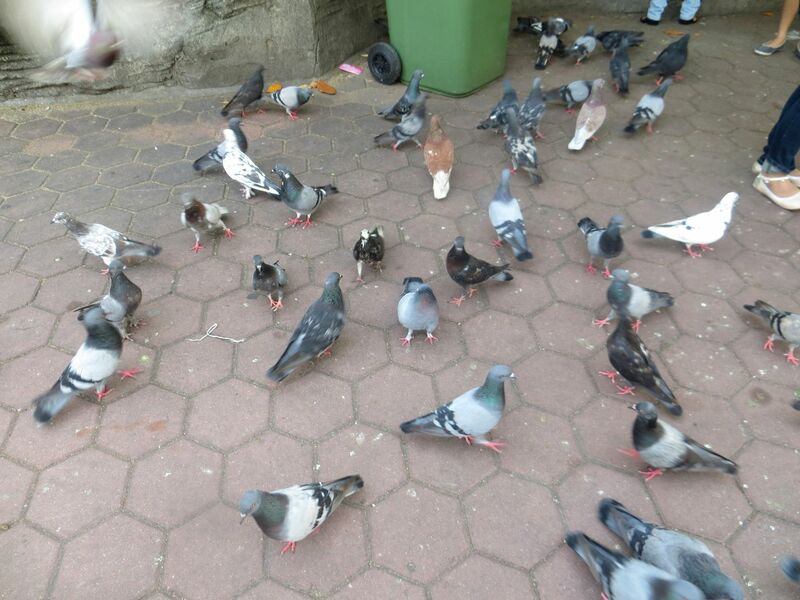 Some of them are cute while most of them just stay there for the food. I even saw a monkey that grabbed a plastic bag with food in it from a lady. My cousin's friend told us to try some of the food they have. 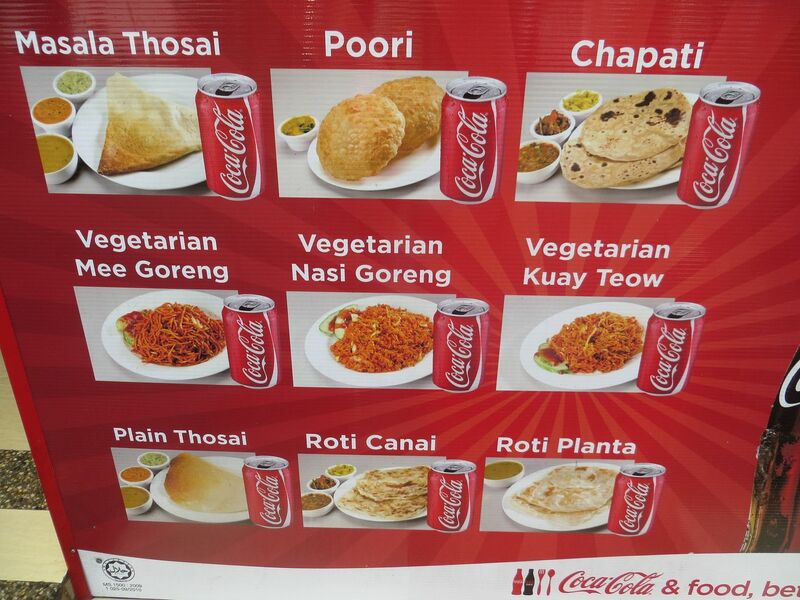 We were told Roti is nice. It's an Indian food, though. 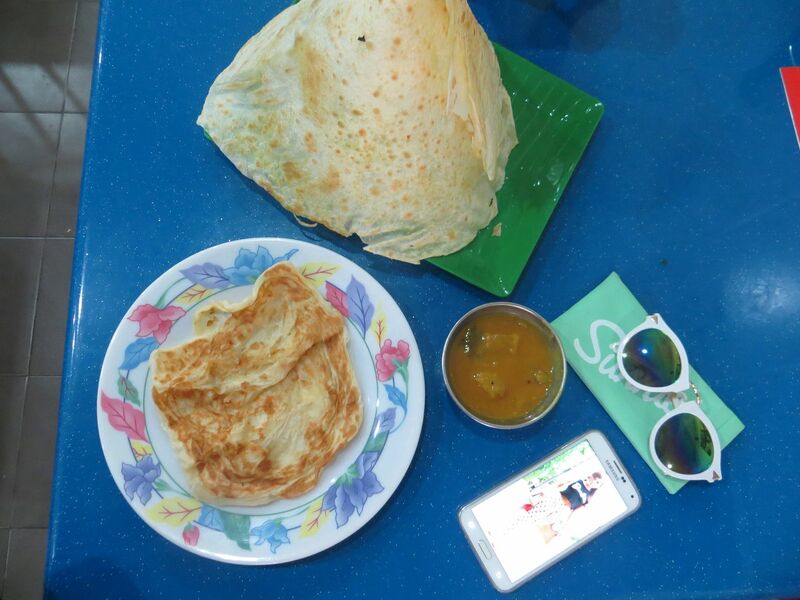 So we went to a restaurant in front of the Batu Caves. I didn't mind taking a picture of it since I was not expecting much. But from what I remember, it's in Stall number 10. Remember we only had 50 RM? And we already used like 30 of it for breakfast, fare and water. So we were broke and hungry in the middle of a foreign country. 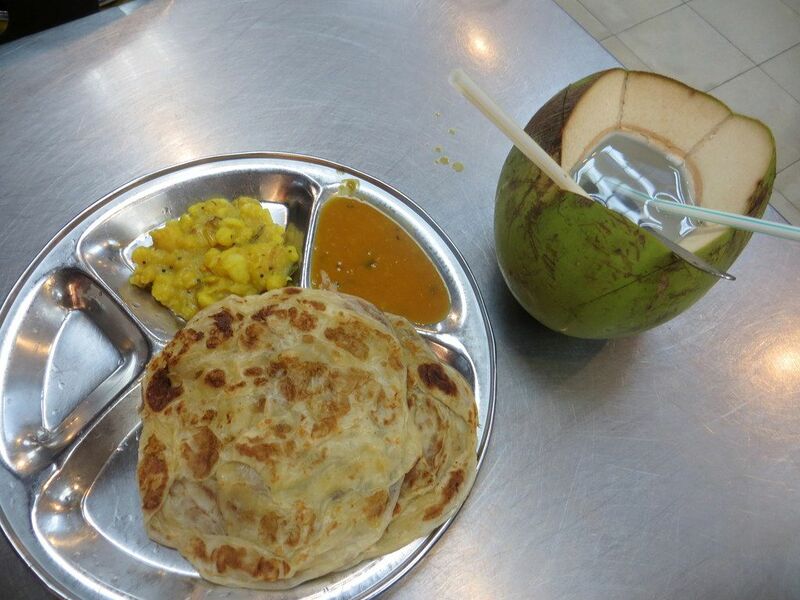 (lol) We ordered this Roti Poratta for 5RM. We wanted to order 2 but we didn't have enough RM for it. We also ordered 2 fresh coconuts for 4RM each. And that, my friends, would be the biggest mistake we'd ever make in Kuala Lumpur. We were thinking it wouldn't be delicious so we didn't want to risk. Plus, we thought we'd find another restaurant that sells it and would be tastier. But we were wrong! I loved the taste of Roti so much that I ate it 3 times that day. 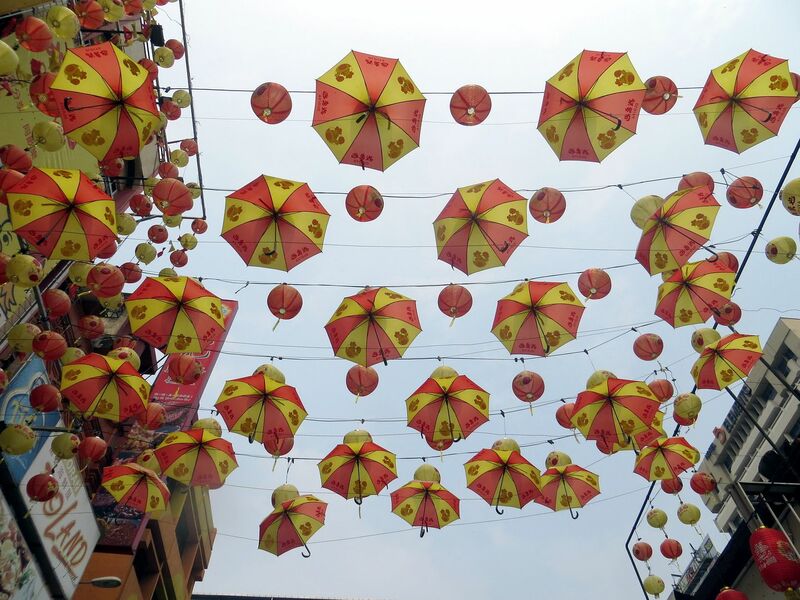 The second one was somewhere in Chinatown and the third one somewhere near Berjaya. The 2 got nothing on the first one. It was just so delicious and tasty! Actually craving for it now as I'm writing this blog post! After eating, we decided to go to Chinatown. But when we were exiting the gate, I saw this statue so I wanted to take a picture of it. Little did we know that there's a hidden cave beside it! The entrance was for only 5RM. I also saw this very inspiring quote/reading. Whatever is happening is also good. Whatever will happen, that also will be good. What did you lose that you are crying for? What did you bring which have you lost? 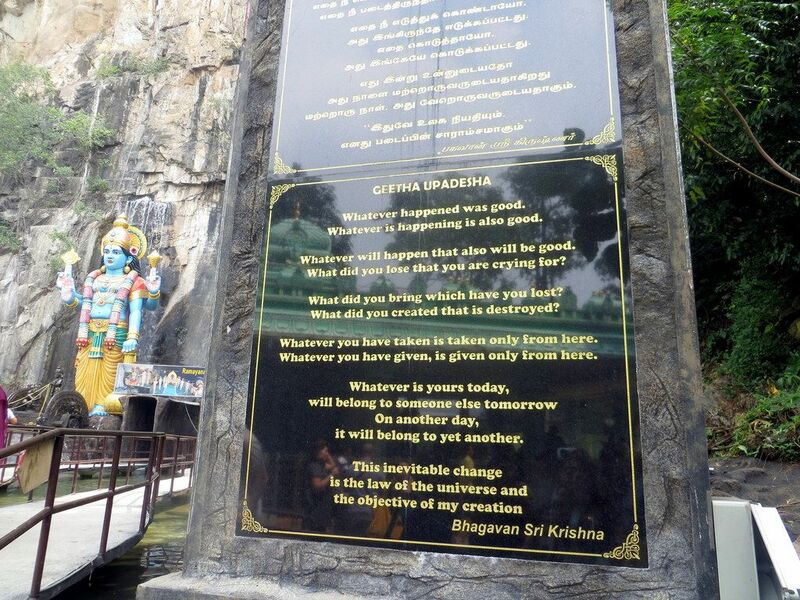 Whatever you have you have taken is taken only from here. Whatever you have given, is given only from here. and the objective of my creation. .
That was so nice, I almost tear up while reading it! 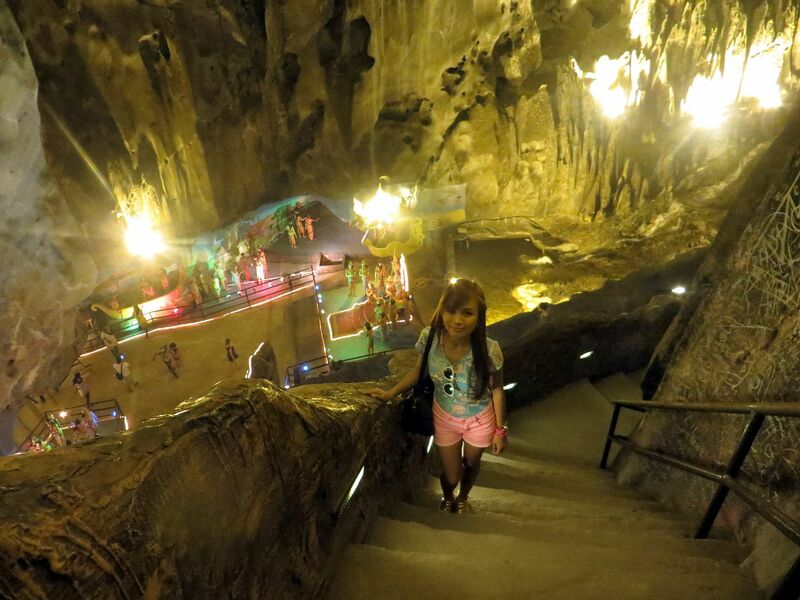 So, the inside of the Ramayana Cave is so nice. The structure of it is so breathtaking. 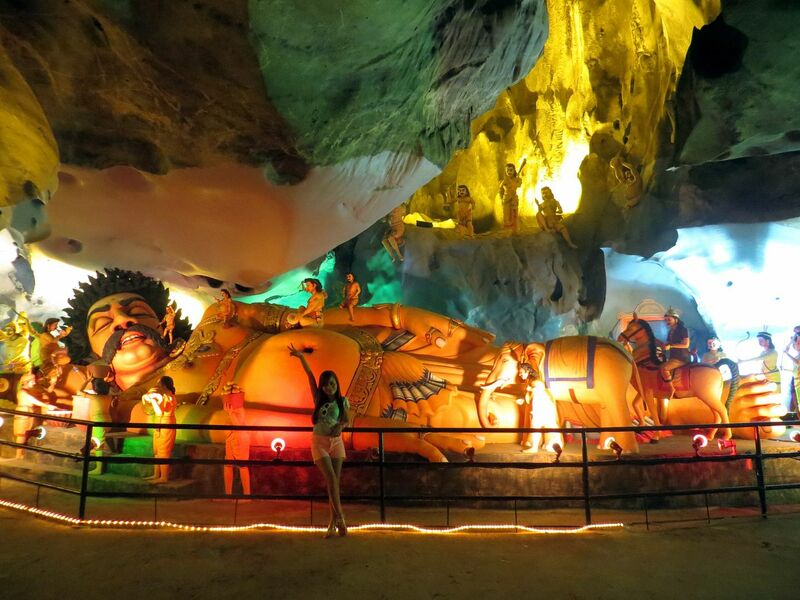 It is also filled with man-made decorations like statues and figures.  This may sound creepy but sometime last year, I had a dream I was travelling with a female friend. I got lost and was trying to find my way back to her when I got lost even more and suddenly got inside a cave. 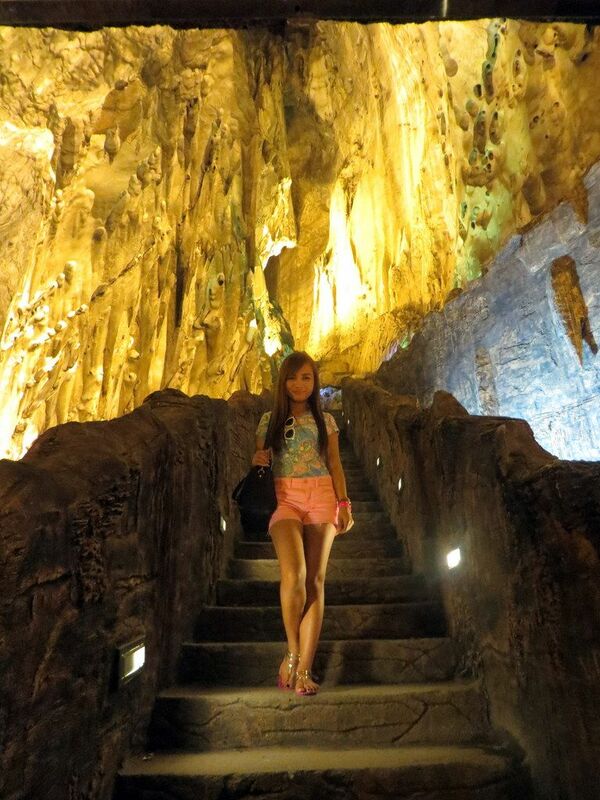 The cave has yellow lighting and when I went in, I saw this tall cave with beautiful stalagmites and stalactites. It was so beautiful that I was in awe, even it it was just a dream. 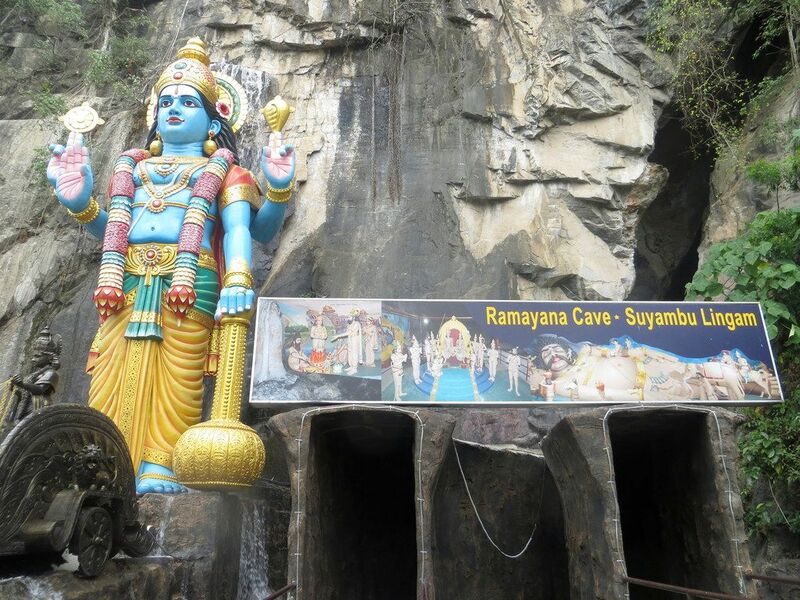 I had no idea about the Ramayana Cave at that time nor have I seen it in pictures. But when I went inside it, I suddenly remembered my dream. And it was so creepy because I was travelling with a female cousin and the cave in my dream was 90% similar to the Ramayana Cave! 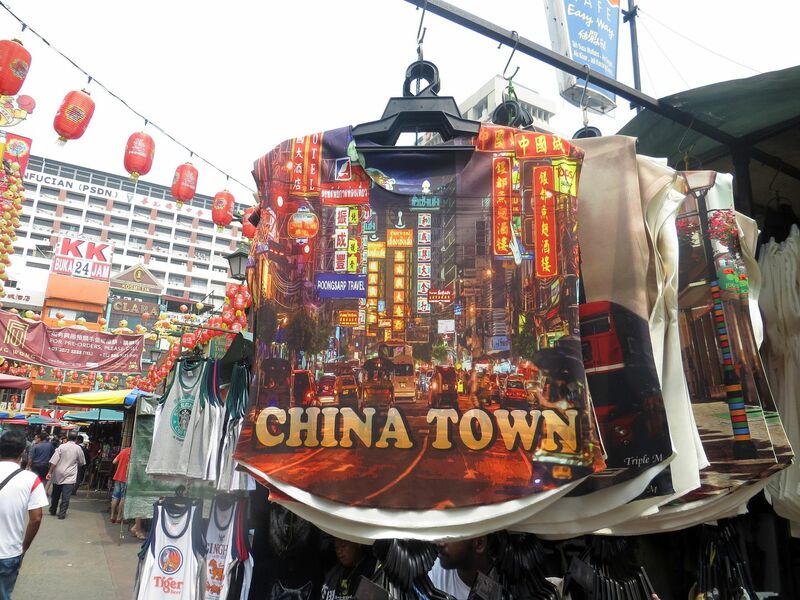 After that, we went to Chinatown for some shopping. We passed by a Money Changer so my cousin and I exchanged $50 each. Yay! Now we have money to spend! 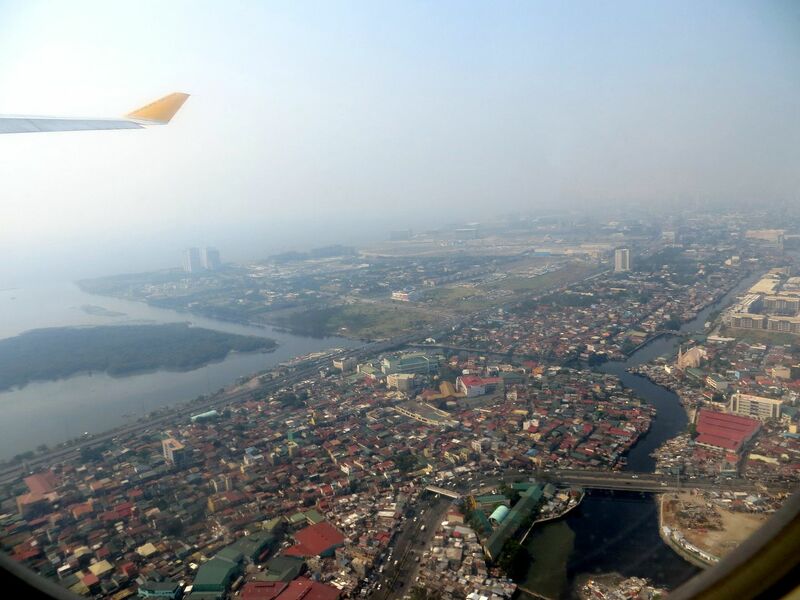 Fellow Filipinos reading this that have never gone to Kuala Lumpur may think that Philippines is just similar to KL. That was what I thought, too. But I was wrong. KL is so much cleaner and more organized that I just sighed. Even the markets are clean and the trains are more efficient. I wish people that manage the Philippines could manage our country more. It's so sad to see the country get left behind by our neighboring countries. I saw some tiny mangoes. I tried them but the taste was weird. It was crunchy and sour, it tastes like green apple, in my opinion. 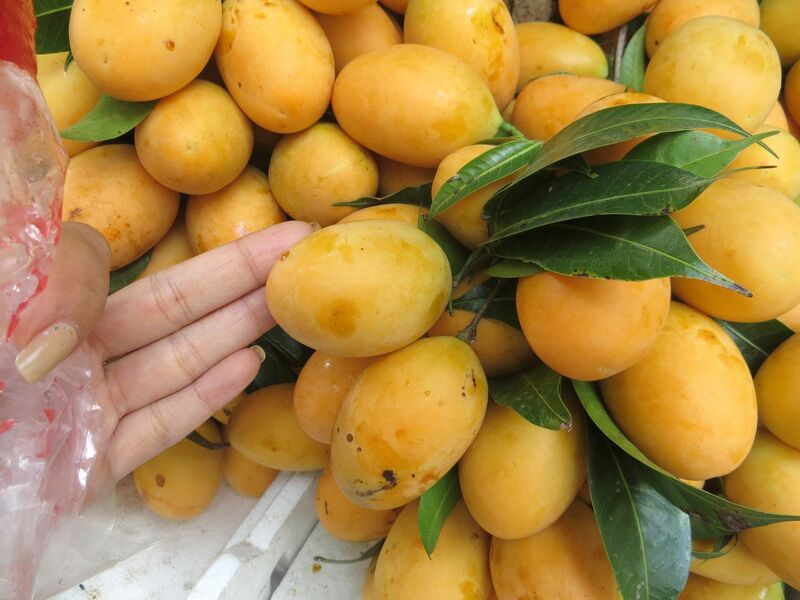 I still prefer my mango to be soft and sweet! Surprisingly, it wasn't so hot in KL that day. But that doesn't mean we won't buy ice cream if we see one. 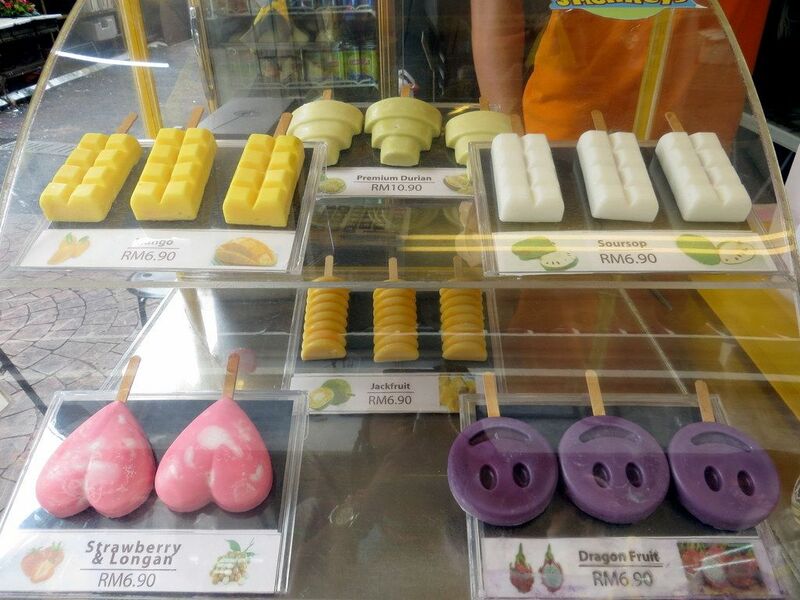 We saw a stall that sells fruit ice cream so we tried it. 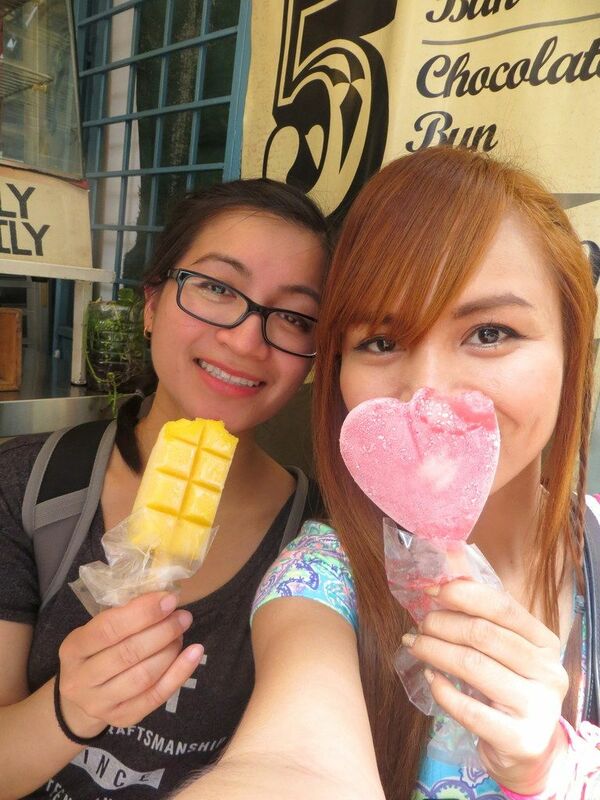 I had the heart-shaped Strawberry ice cream while my cousin had the Mango bar. After shopping, we tried to find our way to the KLCC Petronas Twin Towers. I don't know why, but it was so difficult to find. People tried to help us but they kept on giving us wrong directions. We were so tired and hungry and we also needed to connect to the internet to ask my friend back in Singapore to call our hotel for us to inform them we'll be arriving late. Free Wi-Fi is so rare in Singapore and in Malaysia. Like, why? In the Philippines, just stand near an eatery, a convenience shop or a fast-food restaurant and you'll immediately get connected. But it wasn't the case for us there. It was also difficult because we didn't activate our Philippine numbers for roaming so we couldn't access their mall and train station's Wi-Fi. Surprisingly, the eatery has free Wi-Fi that doesn't require a pin or local number! Yay! We stayed there for about 30 minutes and tried to maximize the free internet use. We finally got to the Petronas Twin Towers but it started to drizzle so we decided to go to the near shopping mall. I was looking for a Samantha Thavasa store but didn't find one. In the end, I bought a Shu Eumura Eyelash Curler for 65 RM. It was so cheaper there than here in the Philippines so I went ahead and bought it. When the drizzling stopped, we went out to finally see the Towers! They were so tall! 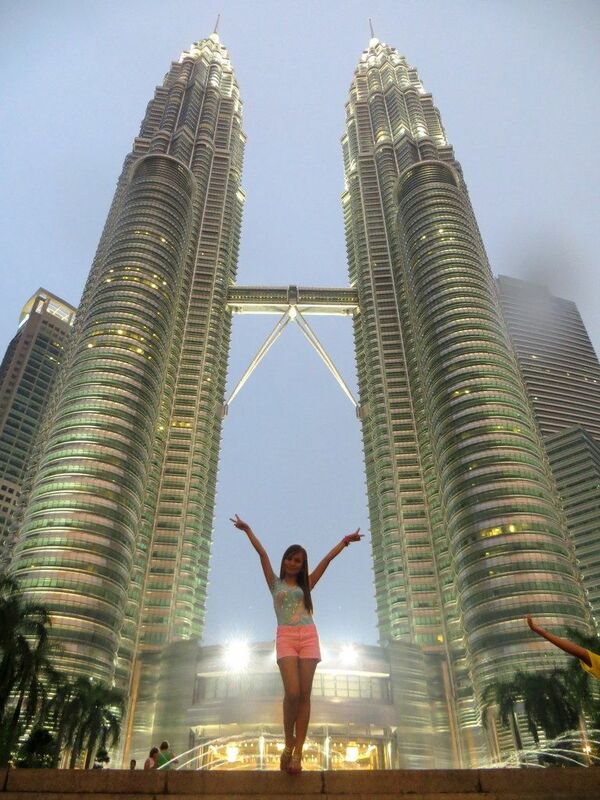 As if being a tiny Filipina isn't small enough, I looked and felt even more tiny standing in front of the towers! It's amazing how a building can be that beautiful and breathtaking. We took a million of photos and stayed there until 8:30 PM. It started to drizzle again but the people, including my cousin and I, decided to ignore the water and just enjoy the view. If we only had booked tickets back to Singapore, we wouldn't have left KLCC so early. But we needed to secure bus tickets back to SG or else, we'd be stuck in KL with not enough money, lack of sleep, sticky body and hair and no hotel reservation. Too much were at risk so we left and headed back to the Berjaya bus station. The moment we left KLCC, fireworks started! 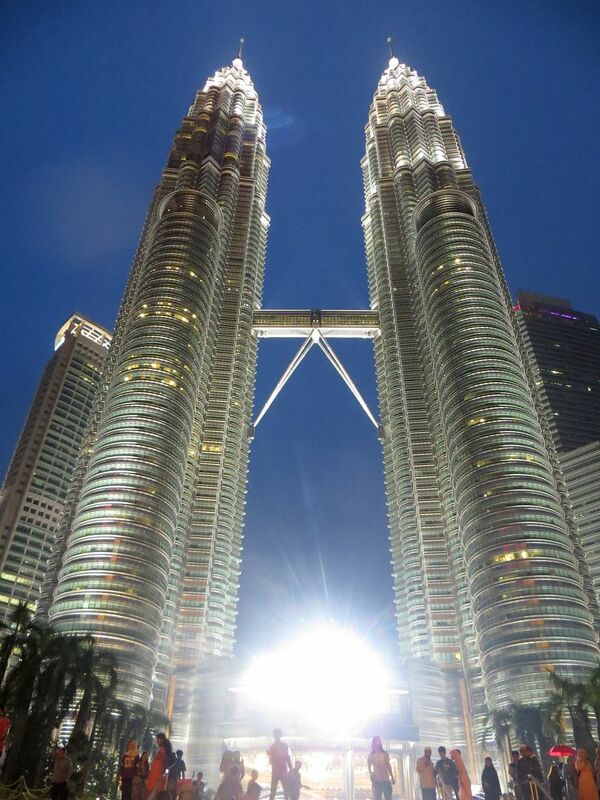 We still saw it but it would have been a perfect sight if we were still in front of Petronas Towers. We got back to Singapore at around 6 in the morning. I don't know why but the trip back was longer. 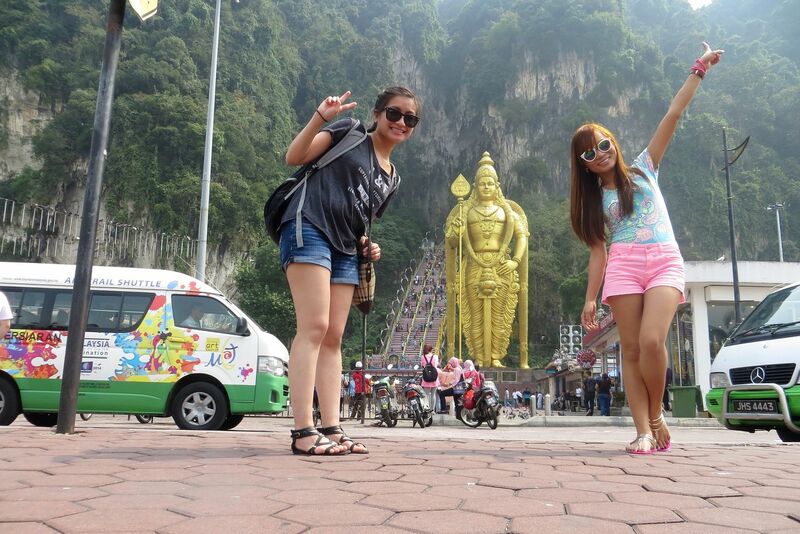 When we got to KL, we didn't have their money. 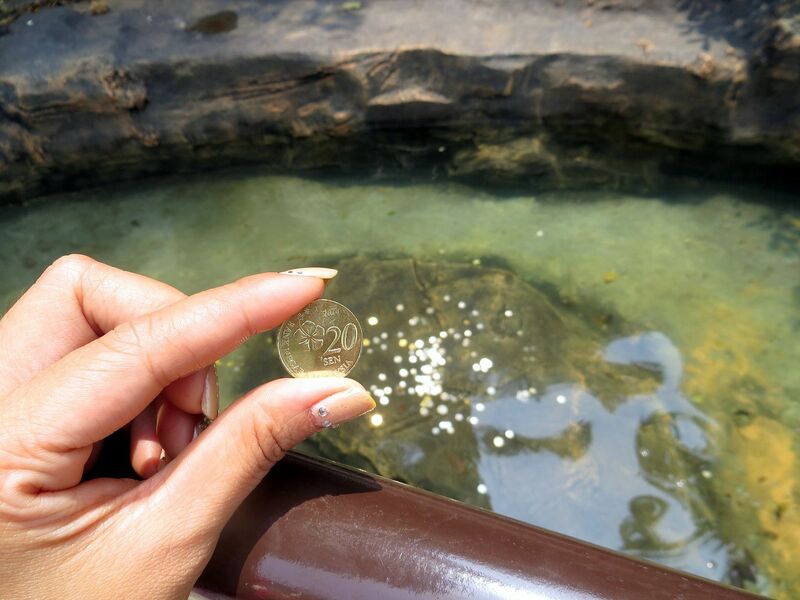 When we went back to SG, we didn't have their money as well. We were surely prepared for this trip! hehe Luckily, the man that sat beside me in the bus was Filipino. I approached him and asked him if we could exchange our RM to SGD. He said he only had 10 SGD and wasn't sure if it would be enough. We were dead tired so we just hailed a taxi. We asked the uncle driver if 10 SGD would be enough since we only had that. 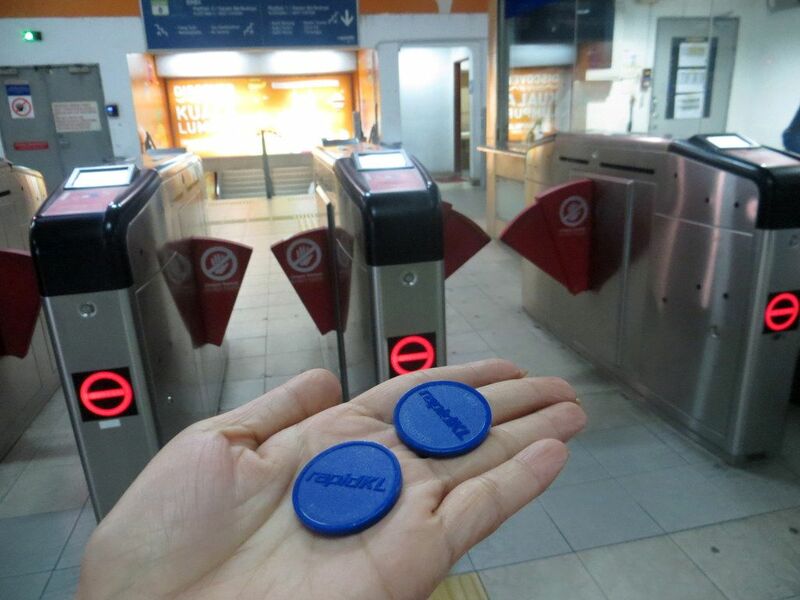 Thank goodness, the fare from the bus station to our hotel was only for $6! Here's a photo of our room that I took. Oh, did you want to know how much we spent in Malaysia?